As always with my reviews of sequels, spoilers for book 1, My Soul To Take, ahead. Kaylee Cavanagh is a bean sidhe. When someone is about to die, she screams out for their soul. So when she's at a concert and teenage star Eden collapses on stage, she's not particularly worried. No urge to scream means Eden's still alive, right? Wrong... which means Eden had no soul to lose, having already traded it away for stardom. Plunged into a race against time to save the souls of those too stupid to hold onto them, Kaylee, Nash and Tod are forced to try and head to the Netherworld to stop the evil beings who are preying on young hopefuls. 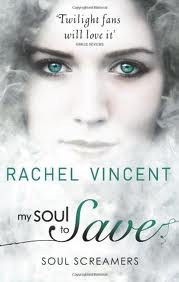 I absolutely love Rachel Vincent's world building and it was great to find out some more about the bean sidhes, reapers, and the Netherworld here. She's a genuinely fresh voice in a paranormal genre which can sometimes feel overrun by vampires, werewolves, zombies and mermaids, and deserves full marks for originality. That said, I wanted to like this one more than I actually did. There's something about Kaylee and Nash, as characters, which stops me from feeling particularly involved in their adventures. They seem a little bland, and Kaylee's desperation to save a girl who had, let's face it, been idiotic enough to get into this whole mess by herself and who Kaylee didn't know at all seemed rather far-fetched, even given Kaylee's obvious guilt at her aunt's actions in the first book. Tod, on the other hand, is a fantastic supporting character who overshadowed the main duo for me, and I sympathised with him as he tried to save his ex-girlfriend and was driven to concealing information from Kaylee and Nash to get a better chance of doing so. I enjoyed the way the corporation who were encouraging the teenage starlets to make deals for their souls were portrayed, although I think the fairly obvious comparisons to the Disney Channel got driven into the ground a little bit too much by the end. Overall I found this a touch less enjoyable than the first in the series but it's still an exciting and well-plotted read which will certainly appeal to fans of YA paranormal books. Book 3 is one that I'll be keeping an eye out for, even if it's not troubling the top of my "must read" list.